Cottage with charm, private pool and internet in the charming Lecrin Valley area, near Durcal, 15 minutes from Granada, 25 minutes from the beach and 50 minutes from the ski resort of Sierra Nevada. The house has a fabulous garden full of greenery, olive trees, hammocks, Balinese beds. It also has a wonderful pool of 10 x5 meters. 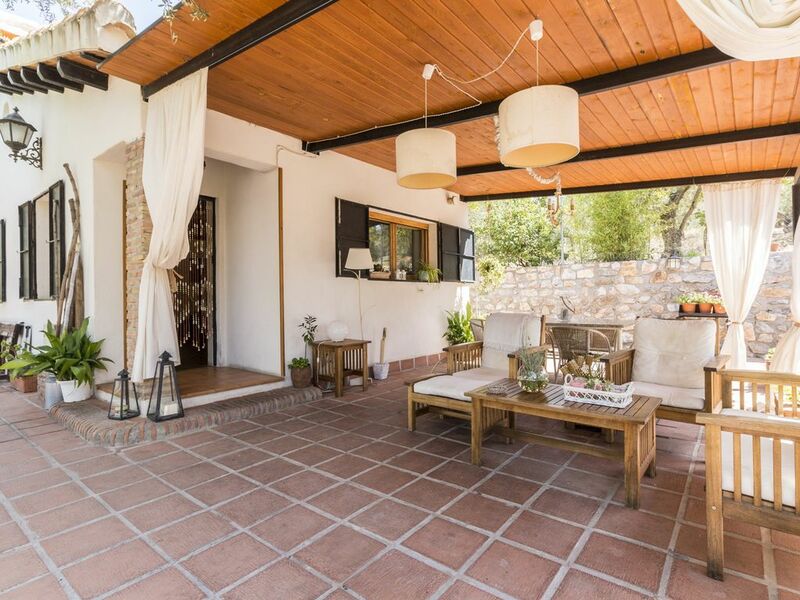 Since its charming porch you can enjoy spectacular sunsets, views of the Lecrin Valley and Sierra Nevada. Feel the air of nature and fresh air. The house has a buhadilla bedroom, living room, kitchen and bathroom, also it has a warm fireplace, Moorish oven and barbecue. The house is about 300 meters away from the health center and supermarket Durcal. It is a perfect choice for a vacation of charm in harmony with nature. Enjoy your dinner on the porch watching the stars. Relax in the garden reading a book or enjoying a sunbath. There is 1 bedroom: 1 double and two singles. Sofa bed and an extra bed, fully equipped kitchen. TV, wifi. Do not miss the opportunity to visit Granada, Lecrín Valley, the Alpujarras and the tropical coast. Please note that a deposit of € 200 in cash is required at the time of entry. If the property is not damaged when out of the total deposit will be refunded. we rent our holiday cottage this year for the first time and we hope the people enjoy the house like us. We have decorated the cottage with great care and the garden is the result of many years of hard work and love. The house have a bathroon with shower. Scool water sports is to 35 minutes. Santa Clara Golf is to 15 minutes. The property is in a nice situation with mountain views. All fixtures and fittings are high quality. Everything is spotlessly clean, it is one of the only times that we have been to a property and felt comfortable about using the cooking utensils! All were immaculately clean. Very private without being miles from anywhere. Great pool, gardens and house. Very helpful hosts. 5 minutes from a big supermarket for convenience. 25 minutes from Grenada and some wonderful drives up into the Sierra Nevada easily at hand. The negative: we can't rent it 12 months a year (my fault, not owner's:) ). A perfect place for a couple's retreat. The property was much as we expected - small but well enough equipped. We visited in February and the house was very cold despite temperatures outside in the upper teens. There is no heating in this house except an open log fire and a small electric heater so it was very difficult to stay warm. The log fire is unusable as it creates huge amounts of smoke in the room despite the owners advice to keep a window open (defeats the purpose of the fire!). The outside area is very good and well equipped with great views to the surrounding Sierra Nevada. The local town was disappointing and not a tourist attraction. There is a good supermarket close by and smaller shops in the town. The owners were welcoming and helpful. A little gem with wonderful outdoor space! We had two glorious weeks in this delightful cottage. The outdoor space was fantastic...even better in reality! The property was clean, well maintained & had everything we required. Antonio was very helpful with advice on local restsurants & places to visit etc. The owner was also on hand if we required anything. It is situated approx 25 minutes from Granada by car, there are also small villages close by that are worth a visit. The local village is 10 minutes walk & has a supermarket, pharmacy etc. We ate at the cottage many nights & enjoyed the wonderful sunsets. I would reccomend this property to a couple looking to escape! We really enjoyed our stay & hope to make a return visit. This was a fabulous experience from the moment we arrived until leaving . The place looked idyllic on the website and lived up to everything . The outside space was private while having tremendous views across the area. Whether it was morning ,afternoon or evening , the setting was perfect . The property was very clean and had everything required .It was around 15 minutes walk into the plaza in the center of the town which was very pleasant .We were initially met by Antonio who looked after the property and he was extremely helpful all through the week with anything we were looking to do. The owner Celi was also very helpful and conscious of ensuring our stay was good . The place was also very handy for Granada which was about 20 mins drive away . .Not only would I recommend it to others but hope to go back for another perfect holiday ! You will have our cottage always open to you.